A district level ‘guardians meet’ was organised by the Bodoland Peoples Front (BPF) at Bodofa Cultural complex in Kokrajhar to discussed about development works & implementation in the district. 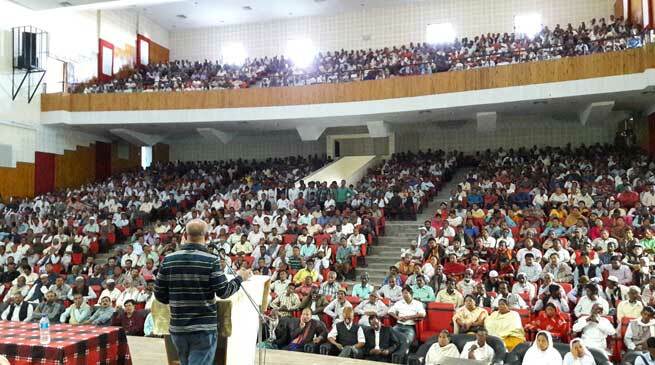 The aims and objectives of the meeting is to reaching out to the public and discussed the issues as one to one. BTC chief and BPF president Hagrama Mohilary attended and in the programme and interacted with the local people. various development works properly for peace, unity and prosperity of the BTC region. Mohilary promised to bring effective development in each constituency and his party is committed to implement its promises and work for all round development of the council region. On the question about the Central package to the BTC, he said the fund is now lying in Dispur and would be released soon. On the Rs 1000 crore special package from the Centre to BTC, also said that they have already sent the concept papers. the Medical college in Kokrajhar will start soon. On the insurgency problem, he said his party is making all necessary arrangement to facilitate all the militants groups from various community like Bodo, Adivasi, Bengali and Rajbongsi and others who are currently under ceasefire to solve their problems. Meanwhile the BPF has plan to organise thsi type of the meeting in every district of the BTAD area.